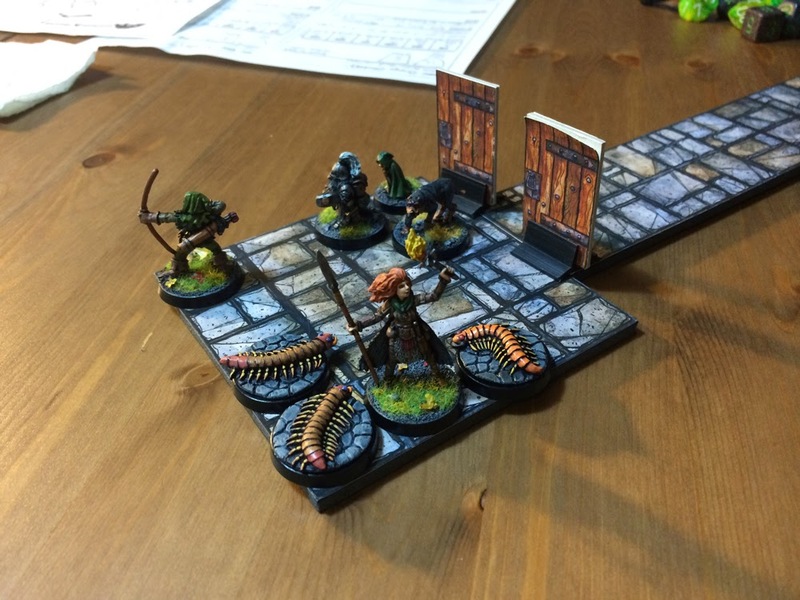 After their harrowing encounter with bugs and kobolds, the party decided to make an attempt at regrouping and healing their wounds with a short rest in the hall. Shortly after sitting down to and pulling out their healing packs, the sound of chittering and chitinous feat on the stone floor could be heard from within the nearby pit. When Audrey approached to peer over the edge she was met by four giant centipedes making their way up the pit's walls. The party quickly dispatched the vile creatures, with Audrey taking some bites during the melee. The group's wounds adding up they decided to find a more secure area where they could rest for a longer period of time to recover. They continued through the door to the north, which lead to another small T-junction. They decided to head west into a small storage room, filled with rotting wood shelves and old, rusted metal-working tools. Within the refuse they found a sledge hammer and a crowbar, which they took. They then moved back out into the hall and traveled east. Checking the door for traps, Grabby indeed found a trap mechanism attached to the doors. Using his tools he carefully fiddled with the mechanism and... maybe disarmed it? He wasn't sure. Broak moved up to push the door open with a javelin, which triggered a massive axe blade to swing out from inside the room, which he managed to avoid. Once inside this small room, they found it was once used as a larder, again filled with rotten and destroyed wooden furnishings and food so spoiled and old it didn't even hold Grabby's interest. While searching the room to secure it, Audrey found to small casks of dwarvish ale (which they decided they'd come back for later)... and more centipedes! Taking more damage from the centipedes, Audrey beame more weakened, but they manage to kill the creatures with Bloo managing to grab hold of one and turn it into a doggy chew toy-ipede. With the three centipedes dead they set about rearming the doors' swinging axe trap to make an attempt at taking a nice, long rest. During their rest they heard the sound of scratching at the door, that eventually stopped (I rolled some giant rats for a random encounter). When Audrey woke from her rest, she felt much more level two-y. Beyond the broken bricks they peered down into another steep staircase leading down into the dark. Ander and Grabby snuck down first to make sure it was clear, it seemed to be, so the others followed. The group entered into another massive, vaulted great-hall, lit by wall sconces: The Great Forging Hall. Adorned with statues of Moradin, strewn rubble, and a large, circular forge pit near the opposite end of the hall, the party cautiously entered the hall. Along the east and west walls were two sets of double doors leading out of the hall, and, of course, several more kobold holes. Audrey and Grabby walked the length of the hall to examine the forge, now filled with old coal and soot. While examining the pit, the silence was interrupted by the sound of a sling stone clumsily cracking against the stone wall as a kobold attempted a sneak attack, and instead swung his sling too close to the wall (I rolled a 1).